Wow. So one man have already achieved perfection? Don't worry @Rami your new razor matches the quality of a Wolfman and comes with two plates to choose from. As @Errol said, there is not much between them. Easily clogs, hard to wash out and harder to keep clean without serious maintenance. Lot’s of moving parts to gum-up or fail. These are not my words; they have been copied directly from the Occam’s own SE description. As soon as I heard about the Occam DE I went straight to the Classic Shaving web site to check the Occam range. Low and behold all Occam SE’s were on sale at less than half the recommended price. Maybe the SE razor that was going to set the world on fire has failed to ignite. Designed in the USA and manufactured in China is the direction some brands have chosen in an effort to keep the costs of manufacture down. Of late the quality of many razors manufactured in China has been quite good and the Occam DE is no different. For something different Occam have include a smooth regular cap and another which Occam are calling a ridge back cap that is designed to assist beginners keep within the proper angle while learning to wet shave; I’m interested in the performance of this learner cap. Both caps and head are sintered stainless steel while the handle is machined. A satin finish has been applied to the head while the handle is polished. A very nice feeling opposing fine knurl has been machined to the handle but if Occam thought it a good idea to show the world that the handle was an Occam by etching a large ‘O’ to the end of the handle they could have at least centred it. The ridge back is an extended triangular shape along the length of the cap; at this time I’m assuming if you can feel the tip of the ridge while shaving your angle is wrong. I’ll find out. A Feather blade is not normally the blade I would give to a beginner but it is the recommended blade for this razor so I’ll start with it and the standard cap. 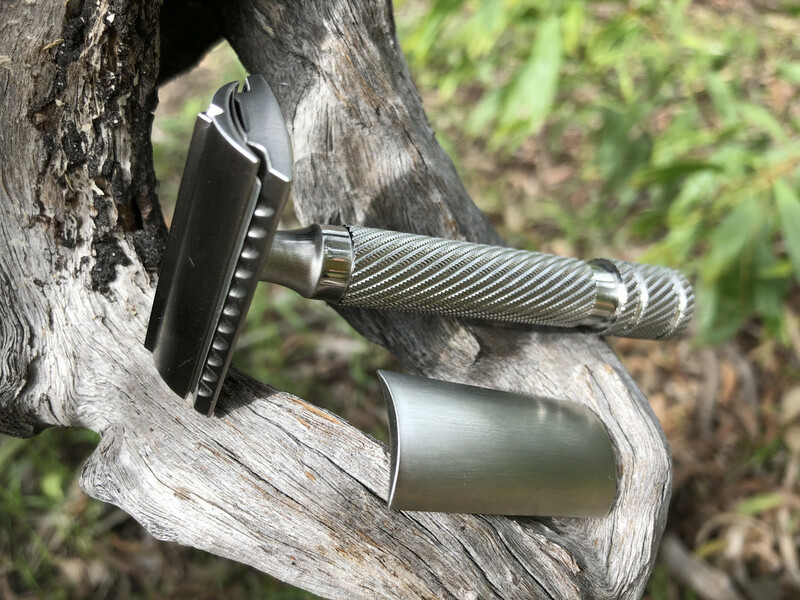 That first shave was not the closest shave I’ve ever had but the Occam certainly tamed the Feather blade at a great learner level efficiency of about Karve CB #B plate. Next shave with the ridge back cap fitted and I was half way through the first pass before I realised that it was fitted. I never felt the ridge cap till I was shaving downwards under the nose and the cap rubbed on the bottom of my schnozz. I then checked angels and if the ridge cap was touching the face there was no blade engagement; another invention that does not work. In the Occam’s favour the second shave with the Feather blade was much closer than the first. At this time my thinking was that if the Occam tamed the Feather blade a second tier blade was going to struggle. You probably cannot get much more second tier than a Muhle blade but this razor/ blade combination operated faultlessly. I did leave the ridge cap on for the remainder of the test but never even felt it was fitted. Overall there is nothing to rave about with the Occam DE. @Errol I do wonder why they bothered with the ridge. Looked very obvious that it was never going to be an effective guide or aide. 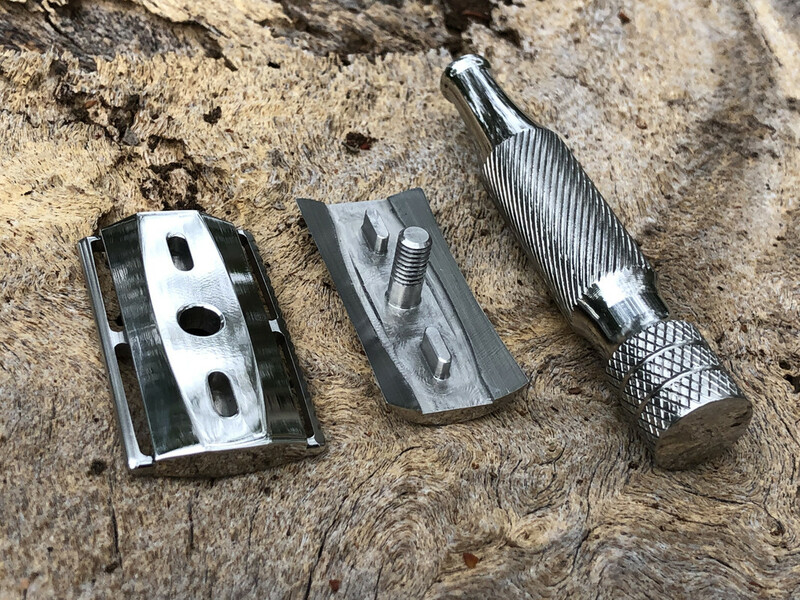 Considering the Walbusch & Sohnes Humpback Slant Razor and the PAA Alpha Ecliptic Slant Razors all have a very considerable bump that actually rests partially against your face. Another fail and as you summed it up, just a razor. Appreciate the reviews, keep them coming. This Occam OREN is the second generation of the Occam SE razor design with changes made hopefully to improve handling and performance. When I reviewed the original Occam SE I was critical of characteristics that I did not particularly like so time to check out if the product upgrades have improved the breed. 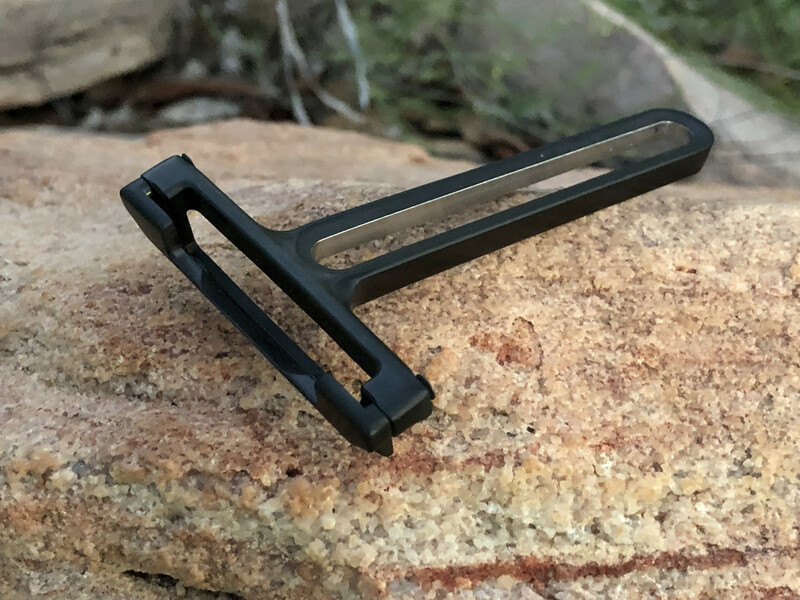 If I thought the original Occam was skeletal in design the OREN has been taken to another level; a near full length elongated slot has been cut into the handle and material has been removed from the guard. Occam claim the size of the guard has been reduced by 50% and this is visually noticeable. The width of the razor head remains the same so it will be interest if the other changes made have done enough to cover this deficiency. Similar to the original Occam the AC blade slips into a groove in the head and is retained by two small knobs with no means of clamping. I had no issues with the floating blade and a smooth, a close shave with efficiency around the Karve CB #C plate using the two dot guard and a nice little bit of blade feel was not enough to get the OREN across the line as far as I was concerned. Reducing the size of the guard has improved to OREN to the point where there are no problems in knowing where the blade is. Modifications to the handle have certainly enhanced holding the razor but it is still not good; that rectangular shape has drawbacks when it comes to holding the razor at certain angles; it is not comfortable but the sticking point that I really do not like with this razor is the width of the head; it is cumbersome in the tight spots. I never felt the need to change the guards on this razor and I have a feeling that the two dot guard on the OREN is marginally more efficient than on the original Occam razor. Again I had trouble loading the blade but for different reasons to the Occam. The blade slipped into position easily without the use of the insertion tool but both times when I pushed on the blade to check it was seated I pushed the blade off the holding knobs and had to load it again. There are better razors around. @Errol that looks like a potato peeler, what's cooking in the kitchen. The first thing to strike me when I picked up the razor was that the edges on the cap are not straight but curved. I’m going to call the shape of the cap ‘cupped’ for want of a better word plus that is exactly what it does, cups the blade. This cupped cap matches the tapered edges of the base plate perfectly to put the blade into tension when everything is torqued down. Seygus Razors refer to the cupped torque to as a ‘quasi slant effect’. I understand the ‘quasi slant effect’ to be something like the twisting effect applied to a blade in a slant razor so I’m expecting a good shave. Seygus have fitted different levels of efficiency to each side of the plate with two different profiles; the flat side of the plate is the mild side while the scalloped edge is said to be a little more efficient. It is not written on the plate but I understand that the mild side has a blade gap of 0.5mm and the serrated side is 0.7mm. 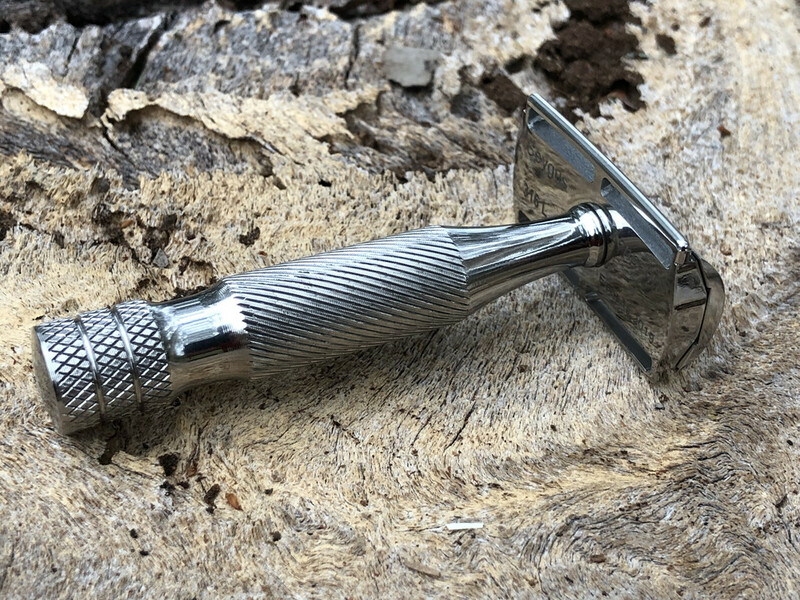 Manufactured from stainless steel, the razor has been highly polished to a mirror finish and is small and chunky with it short bulldog handle. A spiralling knurl is applied to the centre section of the handle with a cross hatch knurl on the end, looks very good. I have not used a dual efficient razor before but know that I tend to use one side of the blade more than the other when shaving. I’ve often wondered that after using any blade for two shaves, if in fact I had still used only one edge of the blade. I’ll just have to pay attention that I don’t roll the razor over during the shave to stay on the chosen side of the plate. With the Zeppelin the first shaved was with the flat, mild side of the plate and a Gillette 7 O’Clock Yellow blade. The result was a smooth shave but miles too mild for my liking; way less than a Karve CB #B plate. With the more efficient scalloped plate the second shave was much better and more to my liking but still under Karve CB #B plate efficiency. A Kai blade was chosen for the third and fourth shaves to liven things up but the result remained pretty much the same. Try as I might to use the flat milder side of the plate during the third and fourth shaves I kept migrating to the more efficient side. That flat mild side of the plate is just not for me. After using a dual plate, I cannot say I’m a fan, much preferring the plate to be the same on both sides but the system does work. The razor gets top marks for innovation and quality of manufacture but is let down by being way too mild.